Steven Kazan filed his first case on behalf of an asbestos victim in 1974 and since then has represented thousands of injured workers and their family members in court cases. 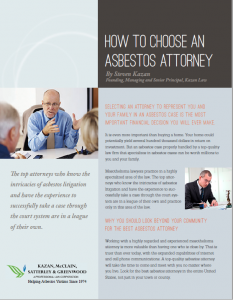 He has dedicated the majority of his practice to representing workers suffering from mesothelioma in third party asbestos lawsuits (against manufacturers, contractors, distributors, and premises owners). In addition, he also represents victims of asbestos lung cancer as well as seriously disabling asbestosis. Mr. Kazan has also been nominated by the U.S. Trustee and appointed by the U.S. Bankruptcy Court to serve as a member or as counsel to victim members on almost all asbestos bankruptcy reorganizations, including Amatex, Carey Canada, Celotex, H.K. Porter, Babcock & Wilcox, Armstrong World Industries (AWI), W.R. Grace, NARCO, Federal-Mogul, Kaiser Aluminum, Global Technologies (GIT), ACandS, ARTRA, Owens Corning, Fibreboard, Plibrico, T&N, U.S. Gypsum, Combustion Engineering, the Muralo Company, Congoleum, Flintkote Company, Special Electric, ABB Lummus Global, T H Agriculture & Nutrition, Leslie Controls, Garlock, and General Motors. In almost all cases where the bankruptcy reorganization is approved, He has been approved by the Federal Court to serve as a member of The Trustees’ Advisory Committee to work with The Trust on behalf of asbestos victims. 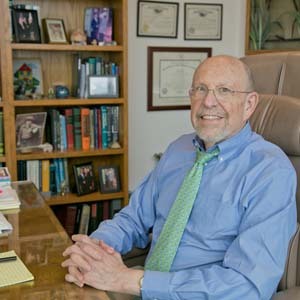 For over thirty years Mr. Kazan has been a lecturer, speaker, moderator, program chairman and participant at various legal, medical, and insurance seminars and conferences throughout the world focusing on asbestos, toxic torts, and mass torts. He has lobbied and testified in Congress on behalf of asbestos victims and before the Senate and House Judiciary Committees on asbestos litigation and legislation.